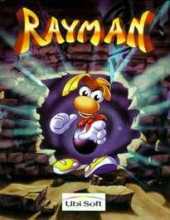 You play as Rayman a cute big nosed chap with no legs, no arms and a head without visible means of support. The game is a traditional side scroller with beautiful landscapes as backgrounds from psychadelic to more psychadelic. It revolves around the titular character's quest to save his world from the evil Mr. Dark. Rayman's main weapon is throwing his clenched fist at his enemies, but as his quest toughens, Betilla the Fairy will bestow him with additional powers. The object of the game is to free all the electoons and defeat Mister Dark's minions across five worlds. Only when every electoon is freed will Rayman be able to enter into Mister Dark's hideout Candy Chateau. Scattered around each level are little blue spheres called Tings. If Rayman picks up a hundred of them, he gains an extra life, but they can also be used to pay the Magician, and enter a bonus stage. When Rayman dies, he loses all of the Tings he collected. As well as Tings Rayman will come across a variety of other power-ups and bonuses, among which a golden punching fist, a faster punching fist, power to restore Rayman's lost life energy and flying blue elves that will shrink Rayman down in size.